Beethoven's legacy to the traditions of Continental chamber music in the 19th and 20th centuries is well documented, as his presence behind the string quartets of the English composer Robert Simpson. But Beethoven has also been a commanding presence for two other distinguished composers of recent British chamber music, Michael Tippett and Hugh Wood. This event brought together all three figures. 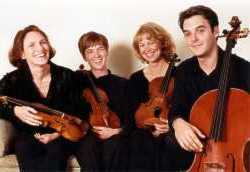 In the evening concert there were performances of Beethoven's String Quartet in F minor, Op. 95, Sibelius's String Quartet 'Voces Intimae' and Tippett's String Quartet No. 2. Before the concert, Hugh Wood held a master class on his String Quartet No. 2, played by the Kings College London Quartet of Music Students: Hannah Bessant and Amy Carruthers (violins), Elizabeth Green (viola), and Gillian Rycroft ('cello). These events were supported by Plumbago Arts (master class) and the Cavatina Chamber Music Trust (concert).